Made in the North of England, quilting has long been a local tradition hand sewn quilts ( made on a quilting frame ) are made up of two layers of material with a wadding (for warmth) sandwiched in between. The three layers are held together by a running stitch in a simple or an elaborate design. Some are real works of art and can be considered a true folk art passed down through several generations. Quilts have long been an interest of mine having been born in the Weardale area and with connections to the surrounding Dales, where several famous quilters lived and worked. I always have a large collection for sale from £80 for a simple wholecloth right up to £1000 for rare Georgian chinz patchworks. 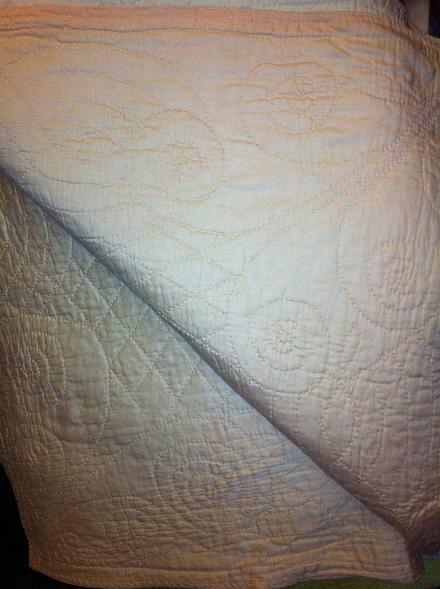 Left hand quilt, a 1920's floral wholecloth hand stitched quilt priced at £265. Some of our Durham quilts and North country quilts, hand quilted patchwork quilts, most of our quilts are around 100yrs old or older.